An International Organization for Standardization (ISO) and other Global System Certification from 164 countries around the globe are harmonizing various standard-setting organizations. Every standard certifying / accreditation body from the member states demand well-organized documents that can define implemented quality, environmental or other systems for the applied certification. Such international systems develop such ISO documents requirements, specifically to formulate the standards that would help organizations to adopt fair business practices. An effective implementation of ISO Documentation leads to the safe production of quality products, environmental protection, offering of high-quality services, information security management, energy management, food safety management and others. Top of it, implementation of ISO documents boost the customers' confidence in your organization. 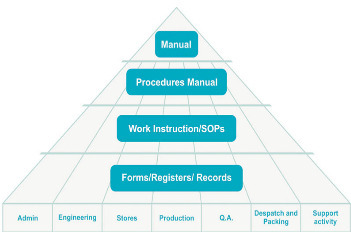 Various clauses of the ISO standards define what to document while going for ISO certification. However, the limitation here is it cannot guide you on how to prepare ISO documents for the quick certification. Here, you need help of an experienced ISO consultant organization that can provide you online ISO documents in editable formats. An experienced ISO Documentation Consultancy helps to document information accurately for such ISO and other International System certification. The accurate documentation accelerates your ISO certification process and minimizes repetitions. It is also handy for educating consumers on what they should expect from such ISO consultant organizations. ISO manual: It outlines step-by-step implementation of ISO documents based on the guidelines published by the International Standards Organization. It defines the macro level system for the related standards. Certification procedure: This document describes the standards you have to attain in order to get certified by a Certification Agency and implement the micro level procedures. Work Instructions / SOPs: This is a detailed course that you have to follow. It entails details on the products, operations procedure, charts, drawings, documents, test methods and the standards expected from the organization. Sample Forms: These documents outline the format of data entry and data management for the maintenance and reference of ISO documents. These forms provide evidence that the system is followed. We, as an experienced and trusted ISO consultant, achieve this by offering 4-Steps ISO documentation consultancy for all ISO certification and other international system and product certification. In our e-documentation consultancy program, we provide online ISO documents for a quick certification to our clients world-wide. We are a team of expert consultants having rich experience in implementing system and / or documentation of ISO certification for more than 1800 clients. Across the globe, any ISO certification seeking organization can contact us and save their costs and time in certification process. The entire communication under this E-documentation consultancy program will be done via phone calls, emails and online conferences. Following are the four steps that we follow in E-Documentation Consultancy projects for various ISO certifications. Gap Assessment Analysis: We conduct gap analysis on the basis of review and analysis of answers to our micro level survey questionnaire. We will ask the process owners to define their processes in detail. Based on the review of your existing system documents and our questionnaire, we will submit you a detailed report. In this report, we will identify requirements to complete the documentation for quick certification. Documentation Preparation: Based on the gap assessment and review of our micro level questions, our specialist ISO consultant will generate the entire necessary documents (ISO Manual, Procedures, Work Instructions, Exhibits and Forms). As per micro level survey responses given by you, we will prepare your documents and submit the softcopy of all 4 tier documents to you via either email or FTP download. The ISO documents that we generate will also address all the requirements of the related system requirements. We will submit you the online ISO documents for your review and finalization. Documentation Requirements in System Implementation: Our specialist ISO consultant will be in touch with you on phones and e mails to discuss the additional documentation requirements during the implementation of your management system. We clarify all their queries related to ISO documents and understanding of the forms. Document Review: Once all the process documents are finalized by you, we will then conduct a desk document review and suggest necessary changes as well as ensure related documentation requirements are completed.